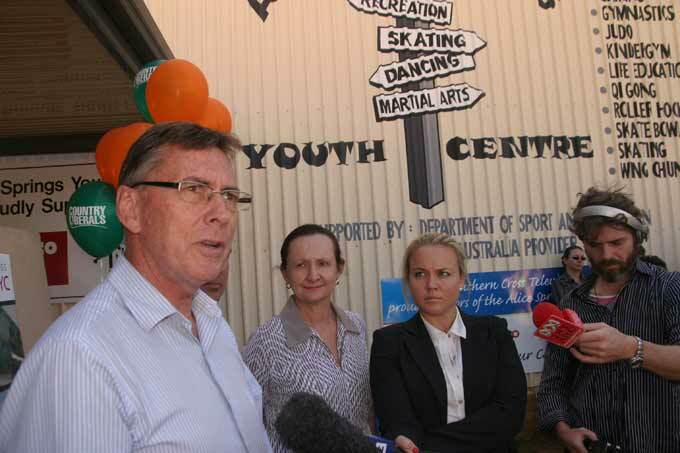 Country Liberals leader Terry Mills pledged $2.5m “to transform the Anzac Hill youth centre into a Police and Citizens Youth Club”. A media release said it will “have access to youth workers and other appropriate support networks as well as organised activities and sports infrastructure. “The existing centre will be re-developed in stages [no time frame is given] and the upgraded facility will include a cafe operated by the PCYC. “The centre will provide a safe place for children on the street at night and opportunities for positive contacts between police and young people. After an inspection of the old and ramshackle building – once the favourite Friday night hang-out for thousands of teenagers over decades – the “whistle stop tour” left little time for local and Darwin media to explore issues. How many blocks at the new Kilgariff suburb will be sold and at what price, the Alice Springs News Online asked. Mr Mills said the issue will be one to be dealt with by the proposed independent Planning Commission “seeking community input early in the planning process rather than at the back end when it hits the Development Consent Authority. “There has to be some confidence over the planning decisions … so we know where we are going and there is confidence in the marketplace,” he said. Will there be an amalgamation of prison and alcohol rehabilitation farms? Where exactly are these rehab places going to be, asked the ABC? TiTree, just north of Alice Springs, has been nominated, Mr Mills said. Mr Mills said these facilities would be for people failing to seek help. It is a measure for “those who breach a court order requiring them to get help. “There would be an additional requirement for that assistance to be sought and provided, and there would be support for those rehabilitation services who are providing it. But Russell Goldflam, president of the Criminal Lawyers Association, says this is tantamount to re-criminalising drunkenness. “There is no power in the Australian legal system to order a citizen who is not suffering from an acute episode of mental illness into ‘a facility’, this is to lock them up, unless they have committed a criminal offence. The current Alcohol and Other Drugs Tribunal has no such power. Drunkenness was decriminalised decades ago in the NT and elsewhere, in accordance with a key recommendation of the Royal Commission into Aboriginal Deaths in Custody, says Mr Goldflam. 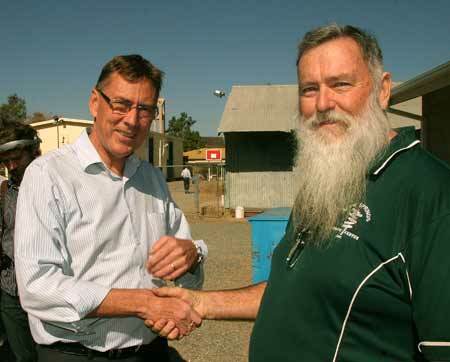 His government would bring in police decision-making “closer to the people of Alice Springs”. 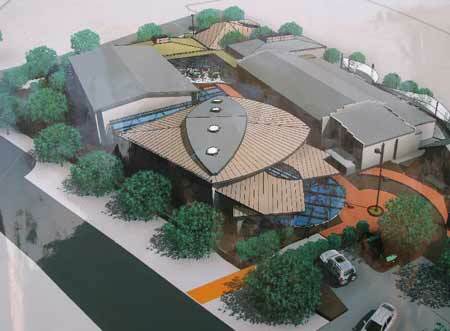 Will there be new infrastructure for tourism, asked the Alice Springs News Online. Has he asked the operators what they want? Mr Mills said his government would not “take Alice Springs for granted” and would be showing genuine respect for Alice Springs. He’d already told the Mayor that he would “respect the third tier of government”. PHOTOS: Country Liberals leader Terry Mills and MLA for Araluen Robyn Lambley this morning, with reporters. A sketch of what the refurbished centre would look like. Mr Mills shakes hands with Alan Page who has been a volunteer at the Youth Centre since 1971. • Would a CL government provide two more lots of $5m to the Alice Springs Town Council, as it requested, for the revitalisation of town centre? (The Labor commitment is for just $2.5m). • What plans, if any, does the CL have for the development of horticulture and agriculture in remote areas to soak up the massive number of unemployed there? I cannot believe that the voters of Alice Springs voted for a party that has committed no more than 2.7 million dollars. Kinda sad that we will be heading back into the dark ages, so I take it that land release will not continue as the CLP stated that they were not going to talk or negotiate with TOs and custodians. So how are we going to progress with this one. Not a huge fan of Labor but at least that finally got land released in the Alice. Steven, it could and will get a lot worse under the CLP if they are not careful, turn on the tap and not doing anything about it is not actually caring for the people of our town. I think that Labor losing the election is not a bad thing, maybe in four years’ time the people of Alice Springs may actually realise that the ALP did do a lot for this town. Given the Country Liberals’ latest policy pronouncements leading to a deepening of the criminalisation of alcohol, this election is increasingly looking like one that Terry Mills would be happy to lose. There is no doubt that the town of Alice Springs would be better served by a GOOD Liberal government but that ain’t gonna happen [any time soon]. I can’t agree with Hal Duell in terms of being bored with NT politics. Territory politics, whether it is a landslide or lineball, is never boring Hal. The only politics in recent years that I have found a degree tedious have been south of the NT border e.g. the last SA election. Not since Ho debated Hum has there been such a lacklustre election campaign. Both sides have promised to do this, and / or to do that, and I have no doubt they fully intend to do this, or that, or both if they can manage it. Or if (heaven forbid) neither, of doing something, even if it’s wrong. But first they will consult. I reckon whoever wins, we’ll see them next in about four years. Again they will promise to consult. And to do this, and / or to do that, unlike the other mob who won’t do either. Neither Ho nor Hum is inspiring. I wonder if they bore each other as much as they are boring me? If the leaders of both major political parties were REALLY sincere, they would spend a week or so at a time in Alice Springs and regional NT. Whistle-stop tours promising a grab bag of goodies during an election cycle is poor management. We deserve better. So do the Tennant Creek and Katherine regions. For too long, the party power machines have been concentrated in the “flip flop” marginal electorates in the northern suburbs of Darwin. Party machines are simply interested in power and winning government. What about the people? Candidates seeking to represent the people not party machines want our fair share for our communities. Little wonder that regional NT is floundering while Darwin flourishes. People there deserve an equal share … and so do we! The Comment by Mr Goldflam is to be expected given that he has been a key player in the support and creation of the disastrous alcohol regime currently in place. Don’t worry about the Country Liberals policy criminalising the population, there’s no room left to jail anyway. There are times I wish I was a cartoonist, I’d love to draw a nice picture of Mr Goldflam and Co standing on top of the Territory prisons jammed full of bodies arms and legs sticking all directions, while making this statement. Bit of a case of the pot calling the kettle black isn’t it l? I think it would be extremely difficult indeed to create further division, isolation and incarceration than the present alcohol regime has been responsible for. I mean, to put it simply, how could we possibly do worse? Have we ever had so many people in our prisons? Who’s been in charge, who’s been giving the advice while that been going on Russell? As I understand it under the Country Liberals those who end up in mandatory rehabilitation will end up there because they have breached an order for the court to seek rehabilitation, they will draw that order because the court will decide that they have committed a criminal act in association with alcohol: things like drunken assault, drink driving, break and enter. So I am quite sure that concerned compassionate lawyers like yourself, Mr Goldflam, are going to advise and assist their clients down the road to voluntary rehab before anyone has to knock on their door. However. whatever it takes to get on top of this issue, we are tired of tolerating the bad behaviour, Mr Goldflam. It’s time there was a consequence for actions, time to protect the community from the drunken criminal behaviour of some individuals, the toothless paper trail of endless warnings that is the tool of the present regime is not only ineffectual but a complete and utter disastrous failure. Yeh, Russell, time to mark the present alcohol policy “Fail”! Do it a couple of times for good measure, then maybe put your feet up for awhile.